In the Renaissance period the Dominican friars, in the context of the “devotio moderna” doctrine, created a new type of religious literature: the “sacre rappresentazioni”. These were ecclesiastical dramas like mystery plays that had nothing in common with the canonical liturgical texts of the mass. “Scene misteri” or “mystery scenes” depicting the lives of Christ, the Virgin Mary, and the Saints were recited by young artists in the streets of their city. In the second half of the 15th century, Florence in particular was famous for the performances of “street mysteries” in which children and young boys played the roles of characters from the sacred drama. 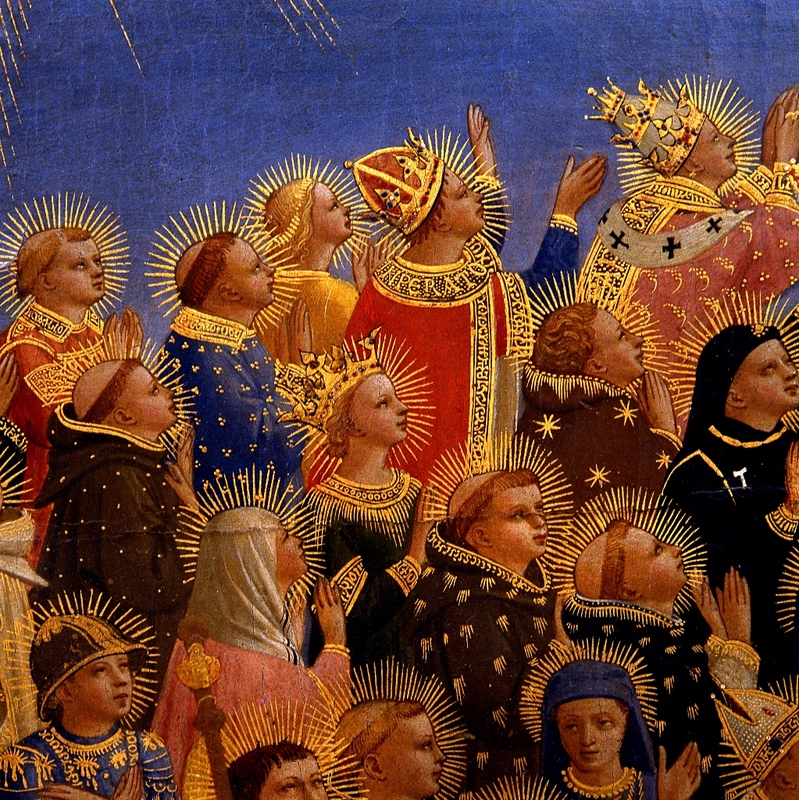 The beginning and end of each mystery was announced by an angel, and at the end of the performance the angel invited all the spectators and artists to sing a triumphal hymn and to join in a circle dance. And so two levels of doctrine emerged. The preaching of the holy Bible in a comprehensible and lively way for the people, and the concept of personal devotion for the monks. The Monastery of San Marco became a centre for this renewal of spiritual life. It was built by the architect Michelozzo di Bartolomeo between the years 1437 and 1444, with a donation from Cosimo de’ Medici, and it was decorated by Fra Beato Angelico between 1439 and 1445. 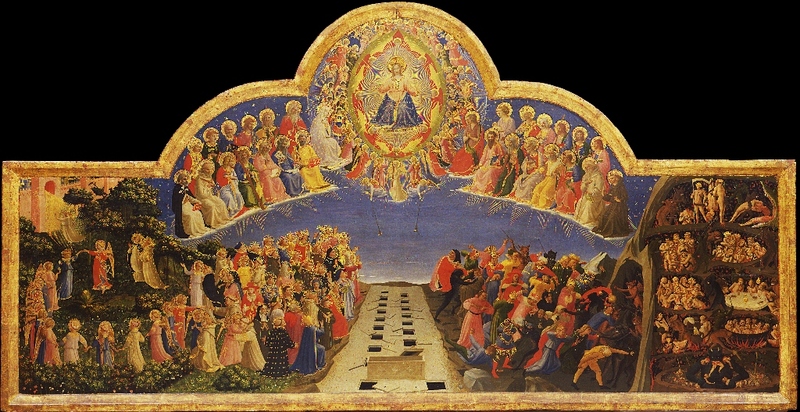 Inside the monastery a circle dance, just like those danced by the people in the squares, can be seen in the paradise section of Fra Angelico’s altarpiece depicting the Day of Judgement. However, following the rule of St Dominic, the monk’s cells could only contain scenes from the Bible, in order to invoke prayer and meditation. 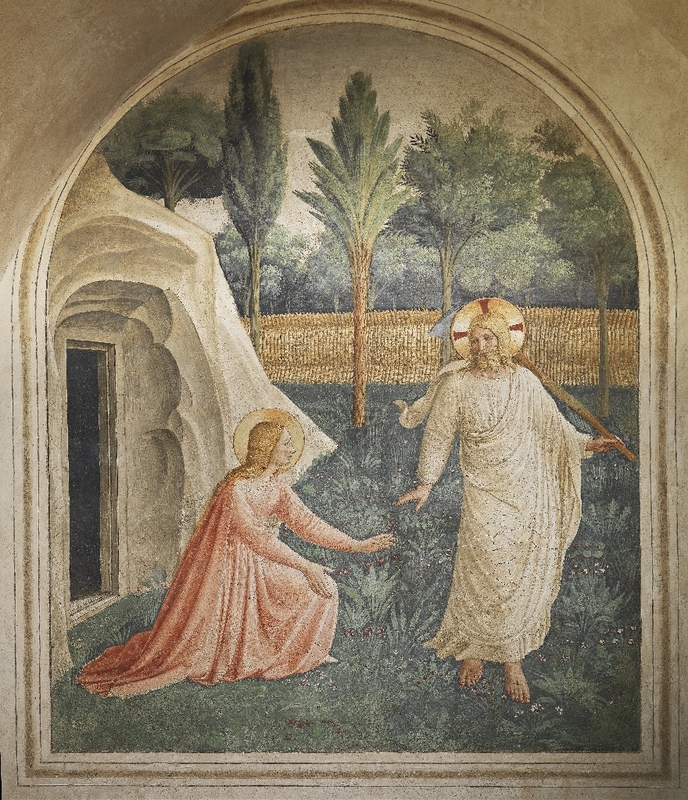 In the first cell of the dormitory, Christ and Mary Magdalene can be seen in Fra Angelico’s composition “Noli mi tangere”. In the third cell we find a fresco of the Annunciation surrounded by plain white plaster walls and an open window. Nothing should distract the ascetic from his prayers. 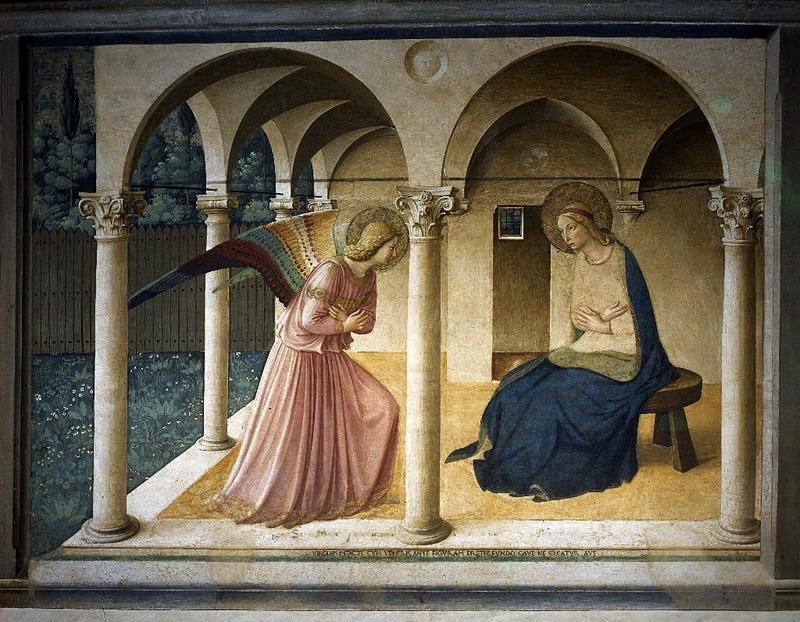 In the composition we see the static figures of the Mother of God and the Archangel Gabriel. St Peter the Martyr, beloved by the Dominicans, is shown behind the Angel, standing in profound contemplation. 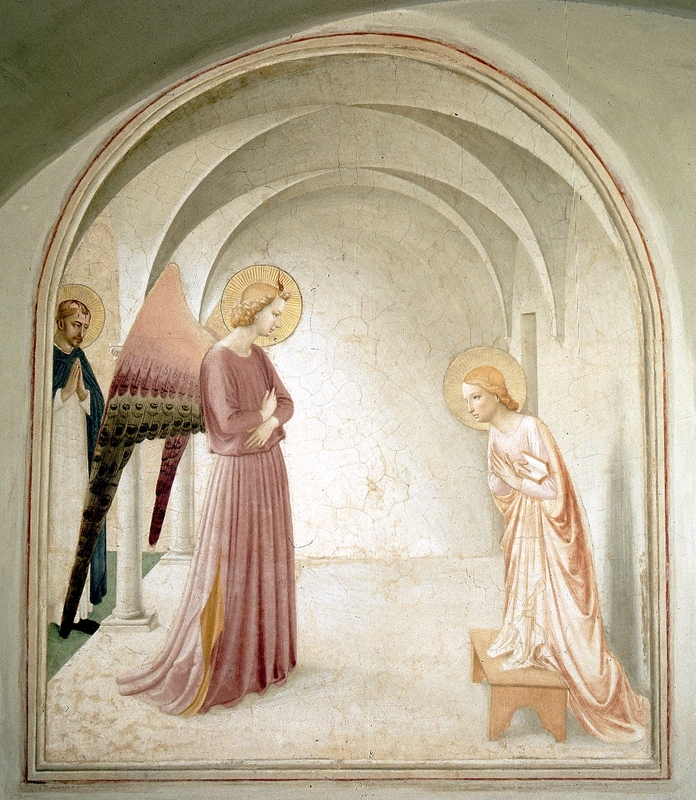 Fra Angelico’s other world famous depiction of the Annunciation, is located opposite the top of the staircase which leads to the dormitories. It announces the “good news” to anyone who enters. The portico depicted in this fresco is based on that of the monastery itself. The three arches behind the Angel recall the Holy Trinity, while the two arches in the foreground symbolise the dual nature of Christ. The monastery is well worth a visit. 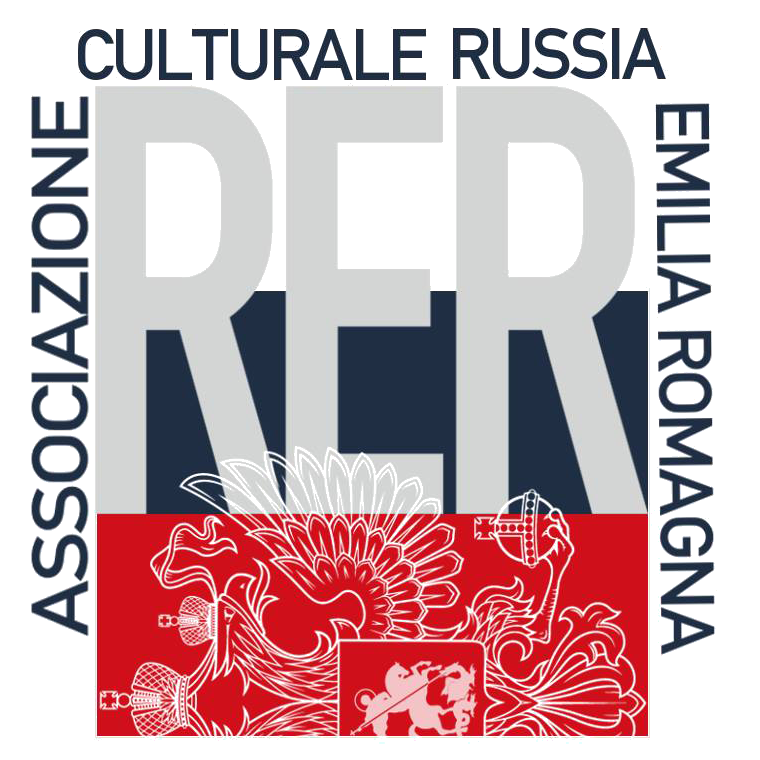 Although it is not that well known, it is a treasure trove of Italian art and has played a fundamental role in the history of Florence. Share the post "Angels in the Monastery of San Marco in Florence"